GitHub - brndnmtthws/conky: Light-weight system monitor for X. Want to be notified of new releases in brndnmtthws/conky? Conky is a free, light-weight system monitor for X, that displays any kind of information on your desktop. 👉 Grab the latest release from GitHub. 📹 An introduction to Conky (YouTube). A plethora of OS stats (uname, uptime, CPU usage, mem usage, disk usage, "top" like process stats, and network monitoring, just to name a few). Built-in IMAP and POP3 support. Built-in support for many popular music players (MPD, XMMS2, Audacious). Can be extended using built-in Lua support, or any of your own scripts and programs (more). Built-in Imlib2 and Cairo bindings for arbitrary drawing with Lua (more). Runs on Linux, FreeBSD, OpenBSD, DragonFlyBSD, NetBSD, Solaris, Haiku OS, and macOS! 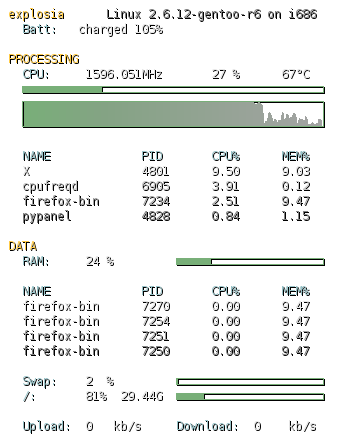 Conky can display information either as text, or using simple progress bars and graph widgets, with different fonts and colours. See the User Configs below for more screenshots and associated config files. And that's it! Check out the Wiki for more details on configuring Conky. Note: To use the AppImage, you may need to install additional runtime libraries. The GitHub Wiki serves as a central hub for all of Conky's documentation. Conky is licensed under the terms of the GPLv3 license. Contributions are welcome from anyone. Please read CONTRIBUTING.md for guidelines on contributing to Conky.